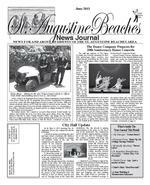 St. Augustine Beaches News Journal June 2013 3 City Hall Update MICHAEL A. DAGOSTINO, O.D. ELIZABETH K. MCLEOD, M.D. MEDICARE PARTICIPANTS ACCEPTING NEW PATIENTS 1400 U.S. Highway 1 South 829-2286 TODD P. THOMPSON, M.D. PAUL W. HUND, III, M.D. N. PATRICK HALE, M.D. Best Vision Center 10 Years WE ACCEPT MEDICARE, BLUE CROSS & BLUE SHIELD, UNITED, CIGNA, AND MOST MAJOR MEDICAL HEALTH PLANS. TODD HOCKETT, O.D. 319 West Town Place, World Golf Village 940-9200 RUSSELL W. NELLIGAN, M.D. * *Cornea Specialist INTRACOASTAL Luxury 1-acre home site with newer dock. Premium Crescent Beach location. Gate and bulkhead. Approx.100 x 584. Public beach access nearby. $725,000 www.7985A1A.com PALENCIA CONDO Elegant single-level condo with screened lanai on premium top service to ground level 2-car garage. 2BR/2BA 1550 sf. $145,900. Move-in Ready. MLS141304 904.461.9066 Laura Radford Novotny, PA Broker-Associate OCEAN FRONT LOT Rarely available ocean front lot tucked into a high dune in the quaint seaside community of Seascape in north Crescent Beach. 52 ft frontage Lot 14 $475,000. The City of St. Augustine Beach has tw o new employee. First, Ms. Cathy Benson is the new Deputy City Clerk. She replaces Ms. Ms. Benson brings extensive experience in the specialized city clerk profession in Florida. She was eight years the city clerk for Safety Harbor, and-a-half years as the assistant to the city manager/clerk for South Daytona. She holds the from the International Institute of Municipal Clerks. She and her husband have moved to the St. Augustine area, where they are having a house built. We also welcome Mr. Joe Howell as the city's new Public Works Director. He replaces Mr. Marc Chattin, who retired at the end of 2012. Mr. Howell is a registered professional engineer in Florida. He has worked on a variety of civil engineering projects in both the private and public sectors in Florida, and supervised the Street, Stormwater, Engineering and Fleet divisions for the city of Casselberry, Florida. He and his family currently live in Orlando. They'll be moving to the St. Augustine area this coming summer. Max Royle, City Manager City of St. Augustine Beach 2200 A1A South, St. Augustine Beach FL 32080, 904-471-2122 PLEASE NOTE: Under Florida law, most communications to and from the City are public records. Your e-mails, including your e-mail address, may be subject to public disclosure. city's handling of the public's money. e. Heard a report from a representative of the North Florida Transportation Planning Organization improvement program. f. Discussed at length with a representative proposal to install red light cameras at certain intersections on State Road A1A in the city. The commission decided it needed more information, especially about the pros and cons of red light camera use in other cities. The police chief, Robert Hardwick, will get this information. Boulevard and 2nd Avenue in the block bordered by 9th and 10th Streets; the second to restrict the location of communication towers in the city. h. Approved two proclamations: to declare May as Older Americans Month, and to declare May 1925 as National Public Works Week in the city. i. Approved the following matters concerning the review of the city's charter that's to begin later this year: approved the letter of engagement with Ms. Marilyn Crotty, who will be the charter view committee's facilitator; approved the city attorney preparing a resolution to establish rules governing the committee; decided to have each commissioner appoint a member to the committee at the commission's June 3rd meeting, and to have a special meeting on June 17th at 7:00 p.m. for the commission to interview and approve by majority j. Directed the city manager to ask the city's grant writing consultant to explore grants for the following purposes: to acquire the remaining 4.5 oceanfront acres of the former Maratea subdivision, to beautify A1A Beach Boulevard, to put underground the utility lines along the Boulevard, to purchase lighting devices for pedestrians crossing the Boulevard, and for the designation and preservation of historic structures in the city, including the former city hall. prohibit pets and other activities at the city's Splash Park. l. Postponed to the June 3rd meeting a decision whether to approve the 2nd Avenue/10th Street drainage project, which will replace the ditch on the east side of 2nd Avenue between B and 10th Streets with a pipe. Residents adjacent to the project area invited to a public hearing on June 3rd. m. Postponed to the June 3rd meeting the remaining topics on the agenda: the discussion regarding changes to the city's building height regulations; the review of the proposed changes to the overlay district regulations; the review of of guidelines for the writing of articles and news advisory committee. The Commission's June 3rd meeting will begin at 7:00 p.m. in the city hall at 2200 A1A South. The public is invited to attend. New City Employees Joe Howell, Public Works Director Recently at the 15th Annual Crime Stoppers within the 7th Judicial Circuit, (Putnam, St. Johns, Hammonds was selected by the command staff to represent our agency as our nominee. At the Ocean Center in Daytona Beach with a packed house of Police Chiefs, Sheriffs, the State Attorney, the Secretary from the Department of Corrections, and numerous other dignitaries, of the Year. St. Augustine Beach Police Chief Robert Hardwich stated, Congratulations to the good work and continue to set the standard. St. Augustine Beaches News Journal June 2013 4 Bill Jones, President www.thecivicassociation.com S. Gary Snodgrass, Mayor City of St. Augustine Beach, FL comsgsnodgrass@cityofsab.org Message from the Mayor St. Augustine Beach Civic Association Professional Packing, Shipping & Mailing Service Center (904)460-0022 With Safe ShipYou Have Options For info & directions please see www.safeshipstaug.com Tell our advertisers and contributors you saw them in the Beaches News Journal Residential/Commercial Prompt, Reliable Service Licensed & Insured Call Us At Wednesdays at Pier Park Contemporary Italian Grill www.cafeatlantico.net TEMPLE BY THE SEA 2055 Wildwood Drive, St. AugustineServices: First & Third Friday Evenings of the Month at 7:30 p.m.Rabbi Mark N. Goldman A Reform Congregation904-819-1875www.templebetyam.org T emple Bet YamReach The Beach By U.S. MAIL! The Beaches News Journal reaches thousands of homes in the Beaches area by U.S. Mail. Greetings fellow citizens! Here are some comments about important developments within our City: City Charter Review As outlined previously, the City must formally review its Charter for possible embark upon this process later this year. Proposed charter changes, if any, approved by the City Commission will be presented for a general vote of the citys registered voters in the fall of 2014. During the interim, a Charter Review Committee composed of citizens (to be selected by the City Commission in June 2013) will be established to review the Citys Charter and submit any recommended changes to the Commission. To ensure that the charter review process is handled in an effective and objective manner, the City has engaged Ms. Marilyn Crotty, Director, Florida Institute of Government, University of Central Florida to facilitate the effort. During a recent presentation to the City Commission, Ms. Crotty made these observations about characteristics of good city charters: constitution in compliance with applicable laws and regulations. The charter should not be based on individuals or personalities in longer view in mind. and compact. They should be readable and understandable. consistent, uniform and unambiguous. but free of details offering basic structure of local government. to the Commission to address evolving circumstances through establishment of Ordinances. friendly. As this initiative evolves, we encourage citizen involvement. All Charter Review Committee meetings will be open to the public with ample opportunity throughout the period for citizen input. Police Department Update At its December 3, 2012 meeting, the Commission approved a motion requiring that the new Police Chief conduct a comprehensive assessment of the Police Department including its policies, procedures needs and related issues, and that he submit recommendations to this Board by July 1, 2013. The Commission expects Police Chief Robert Hardwick to submit his report within the next month for review by and discussion with the City Commission at its July meeting. Strategic Planning Update In April 2012, the Commission and City Staff met in a one-day workshop to discuss our vision for the future. At that time, we assessed the strengths, weaknesses, opportunities and challenges facing St. Augustine Beach. We addressed in the planning horizon (3 to 5 years) and incorporated the list into seven broad, under each goal. Priorities were selected for implementation in such areas as pay and City employees; review of land development regulations and parking; public safety and infrastructure initiatives including updating the storm water master plan and developing parks; reviewing investments, reserves and fund balances; updating a comprehensive economic development plan (and economic philosophy); and a review of inter-local agreements with various governmental bodies. An update report on the status of these and other initiatives will be made at the July and August Commission meetings. We value your inputs and ideas for making our City a better community. For all of us, its the place we call home. Best regards, S. Gary Snodgrass Services for St. Johns County. Billy Zeits said Beach Services would reimburse us for the purchase of an all-terrain vehicle because its primary use would be for beach patrol. We decided on the Polaris Ranger and made the purchase from First Coast Power Sports of St. Augustine. Dealing with the General Manager, Shannon Ashley of Power Sports was a great experience and she made the purchase seamless. We then took the Polaris to Alein Brown at Signs Now for some ideas St. Augustine Beach Polaris (continued from page 1) The St. Augustine Beach Pier Park is a great community asset to provide a venue for the events are conducted by many volunteers to make these events successful. Major events during the spring and summer is the Taste of the Beach and the Wednesday Morning Market from 8:00 a.m 12:30 p.m every Wednesday morning and Music by the Sea every Wednesday evening from 6:00 p.m through September. The Taste of the Beach just concluded May 19 with great food and a great crowd. This is a major event to support Play It Forward is in need of Instrument and cash donations. Previously used instruments can be brought to St. Augustine Jazz Society events (http://staugustinejazzsociety.net/ calender.html). Donation will help reach more local students as we partner together to bring the Gift of Music to every home in St. Johns County. To learn more about Play It Forward we suggest picking up the St. Johns Parent Magazine. An extensive article will come out in the August Issue with a mention of the program in June. Play It Forward exists Music Instructors and Band Directors. For more information call Sterry Piano Company at 829-9829 or go to the Play It Forward link on our home page: SterryPiano.com. on how to mark the Polaris so the public know its a law enforcement vehicle. Gina Vargas, whom is the production supervisor with Signs Now quickly took on the task and produced a professional look that sets the standard. All of the including myself attended training and operate the Polaris. The Ranger Polaris is now actively patrolling our beaches on a regular basis. St. Augustine Beaches News Journal June 2013 9 Beaches Bistro By Paolo Pece, Cafe Atlantico cafeatlantico@comcast.net Beef Braciole INSURANCE NETWORKFIRST FLORIDAFIRST FLORIDA IS ST.JOHNS COUNTYS PREMIER HOMEOWNER INSURANCE AGENCY St. Augustines Oldest Continuous Insurance Agency DESIRED DWELLING COVERAGEYEARLY PREMIUM ADDL DISCOUNTS AVAILABLE $200,000...............................................$695...............................home/auto discount up to 20% $250,000...............................................$875...............................home/auto discount up to 20% $300,000.............................................$1044...............................home/auto discount up to 20% $350,000.............................................$1214...............................home/auto discount up to 20% $400,000.............................................$1384...............................home/auto discount up to 20% $450,000.............................................$1563...............................home/auto discount up to 20% $500,000.............................................$1723...............................home/auto discount up to 20% $550,000.............................................$1892...............................home/auto discount up to 20% $600,000.............................................$2054...............................home/auto discount up to 20% $650,000.............................................$2230...............................home/auto discount up to 20% $700,000.............................................$2350...............................home/auto discount up to 20% $750,000.............................................$2569...............................home/auto discount up to 20% $800,000.............................................$2689...............................home/auto discount up to 20% $850,000.............................................$2812...............................home/auto discount up to 20% $900,000.............................................$2893...............................home/auto discount up to 20%Includes $300,000 Liability Coverage, $1,000 Medical Payments to Others and a $2,500 AOP Deductible. Based on 2009 Masonry Home St. Augustine Beaches News Journal March 2013*HIGHER LIMITS OF COVERAGE AVAILABLE*Please review this proof of your ad closely as it will be printed as it appears here unless corrections and/or changes are sp ecified by you on this proof. If there are any typographical errors or errors of omission, please return information to our office as soon as possible. This proof was created based on the information provi ded to our representative by you or a representative of your company. We cannot be responsible for content and copy of your ad except as noted on this proof form. ______________________________________________________________________________________________ Approved Date Approved with noted changes Date Insurance provides disaster protection and peace of mind. The last thing newly robbery. Young marrieds have to make several adjustments when planning for two. They depend on each other for support havent considered before. In merging two households and perhaps two careers, couples need to consider how they will protect their assets. When you buy homeowners insurance, dont be surprised when the insured value of the house is less than the market value. Theres no need to insure the land the house is on. The insured value the home if there is a major disaster. Be sure the coverage keeps pace with additions or major improvements that increase the value of the home. Coverage will cost less if you set the deductible as high as you can afford. A standard homeowner policy includes a limit on personal possessions, so to cover high value items. Merging two households presents a good opportunity to do a home inventory. This helps couples understand what their insurance coverage needs are, and provides have a record of what to claim if a real disaster strikes. When arranging homeowners insurance, one important decision involves replacement cost versus actual By Jane Tucker, First Florida Insurance cash value coverage. Replacement cost pays the dollar amount needed to replace a damaged item with one of similar kind and quality. Actual cash value covers the amount needed to replace the item, minus depreciation. When you start having children, youll likely acquire more belongings such as additional TVs, home computers, or other electronic equipment. Make sure your homeowners insurance keeps pace with your growing family and possibly a larger home. Consider inflation protection so that the homeowners insurance automatically rises with property values in your region. Safety features, such as alarm systems, smoke detectors, strong doors and deadbolts, not only keep the family safe, they save money because they reduce the likelihood of insurance claims. If you plan to add a family dog, check with your insurer before bringing home an aggressive breed. If you have a backyard pool, trampoline or swing set, consider increasing your liability coverage through an umbrella policy in case someone is injured on your property. First Florida agents invite you to take their Quote Challenge. Call First Florida to discuss your current policy coverages. Their goal is to be certain you have the absolute best rate for which you qualify. Call 808-8600, click on www.firstfloridainsurance. com, or come by to visit one of First Floridas friendly agents. Homeowners Insurance The intensity of a good Cabernet pairs very well with the red meat, the saltiness of the prosciutto, and the depth of the tomato ragout. Serves 4. thin slices approximately 1/3 inch thick nuts) romano cheese tomatoes pieces dredging Place each slice of beef between 2 sheets of plastic wrap and pound with a meat pounder until 1/4 inch thick. Sprinkle with salt & pepper. Lay a slice of prosciutto on each one and sprinkle evenly with with the pignoli beans, pecorino romano cheese, garlic and parsley. Roll up the slices, tucking in the ends and tie with kitchen string. Heat 1/4 cup of the olive oil in a large frying pan over medium heat. Dredge excess, then place in the pan. Cook until browned on all sides, about 15 minutes. Heat the other 1/4 cup of olive oil in a large saucepan over medium heat. Add the onion, carrots, and celery. Cook, stirring until tender but not browned, about 10 minutes. Add braciole, bay leaves, and salt & pepper. Add red wine and cook until most of liquid evaporates, about 2 minutes. Pass the tomatoes, with their juices through a food mill or sieve into the saucepan. Fill one of the tomato cans 1/2 way with water and add to saucepan. Add tomato puree, turn heat to low and cook at a simmer until beef is tender 1.5 2 hours. Sprinkle the basil over the rolls, and cook for 2 minutes longer. Transfer to serving plates, spoon the sauce over the top and serve at once. St. Augustine Beaches News Journal June 2013 11 See a full listing of our services and specialists at www.firstcoastrehab.com where patient care comes first829-3411 1 University Blvd. St. Augustine, FL 32086 Scar Tissue may be the underlying problem if you are limited by pain or immobility from: Abdominal surgery Back surgery Burns Chemo ports Contractures Crush injury C-section Diabetic injection sites Endometriosis Fracture Infection Joint replacement Mastectomy Open-heart surgery Plantar Fasciitis Repetitive stress injury Superficial scar Surgical adhesions Tennis or golfers elbow Trauma Scar tissue is part of the bodys normal healing process, but sometimes it gets out of control. In these cases, scar restricts the bodys natural movement...and those restrictions cause pain. Thats where we come in. Scar tissue hurts.Y ou dont have to.